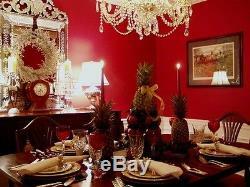 Waterford Lismore Crimson Hock Wine Glasses Pair. 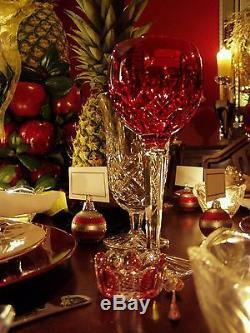 The Waterford Lismore Crimson Hock Wine Glass is a popular addition to Waterford's Lismore collection. Lismore Crimson hock wine glasses feature a seamless fusion of rich crimson red with the classic Lismore diamond and wedge cut. Waterford Lismore crimson hock wines are bright, bold and elegant. Perfect for the holidays and every festive occasion, Waterford's red Lismore Hock wine glasses make a great gift and are wonderful to own and use. The Crimson Collection is a seamless fusion of rich crimson red featured on 2 different cuts, the unmistakable Lismore pattern and a deep flat cut pattern. 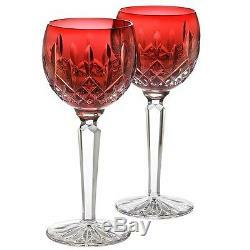 Take some time to enjoy the finer things in life with the Crimson Hock Wine Glass Pair by Waterford Crystal. 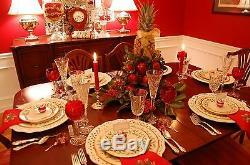 Whatever the occasion, the Waterford Crystal Crimson Hock Wine Glass Pair is a fine addition to any table setting. The Waterford Crystal Crimson Hock Wine Glass Pair complements any white wine with the unparalleled brilliance of Waterford Crystal. A stunning reworking of the classic pattern that has been a favorite for generations, the Crimson crystal stemware collection by Waterford Crystal brings the traditional beauty of Waterford to any situation with a daring twist. 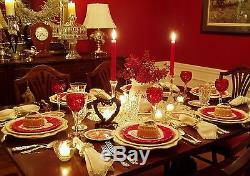 The Waterford Crystal Crimson stemware pattern features the classic crosshatch cuts in bold red crystal. Synonymous with luxury and fine living, the Waterford Crystal Lismore pattern has been Waterford's pre-eminent design for 60 years. Influenced by the 18th century crystal designs of Waterford founders George and William Penrose, Waterford Crystal designer Miroslav Havel created the Lismore pattern in 1953. The pattern features refined diamond cuts- a signature of early Penrose designs- and a symmetrical series of upward flowing wedge cuts. The clarity of the crystal combined with the refraction of light through the cutting created what the world now treasures- the enduring allure of Lismore. The Waterford Lismore Crimson Collection is a seamless fusion of dramatic color and the brilliance and clarity of the classic Lismore pattern. These boldly colored Lismore Crimson Hock Wine glasses enhance the aesthetics of both red and white wine. The intricate detailing of Lismore's signature diamond and wedge cuts serve to showcase the bold coloring of the Crimson Collection, and, combined with the comforting weight of Waterford's hand-crafted fine crystal, serve as stunning examples of drinkware that define traditional styling even while transcending it. 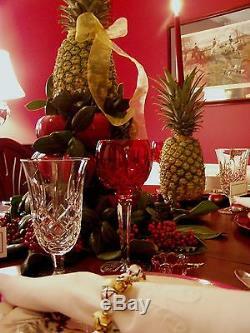 Pattern, and our crimson wine hocks and fluted champagne glasses, with brilliant red bowls and clear stems and feet, are stunning! 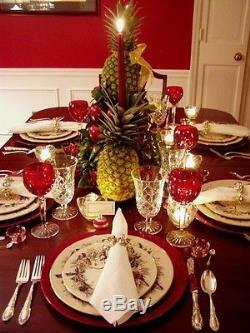 Cant you just see your dessert buffet, decorated with an American eagle figurine and bunting as a centerpiece, accented with this magnificent crimson Lismore crystal? Always recognized for the quality of its wares, Waterford Crystal is one of our oldest manufacturers. In 1783, George and William Penrose opened the Flint Glass Works near the quay in the harbor town of Waterford, Ireland. Ironically, the brothers were not glass makers, but exporters. But from the outset, the brothers demonstrated real business savvy. They petitioned Parliament for government subsidies and began to woo the aristocracy of Ireland and England as a market. In 1788, Waterford produced a crystal service as a gift to her Majesty, Charlotte Sophia, wife to King George III. The King and Queen were so charmed by the crystal that they ordered the set to be displayed at Cheltenham castle. Ultimately a new factory was opened almost 100 years to the day after the closing of the old facility. For centuries the Irish have been supreme artists in glass. It is one of the great traditions in the realm of art, a tradition founded on patient and meticulous hand craftsmanship. The skill of Irish hands is only part of the story - there is also an uncanny power in those hands to impart something magical to glass. And in all of Ireland, no hands have been more patient, more meticulous, or more blessed with the elusive powers of art than the hands of Waterford crystal's craftsmen. When the brothers George and William Penrose founded the Waterford Glass House in 1783, they made a bold promise - to make Waterford crystal in as fine a quality as any in Europe in the most elegant style. It was no idle boast. They had in hand the old secrets of mingling minerals and glass to create Waterford crystal of beautiful and mysterious qualities. It sang sweetly at the tap of a finger. It felt soft and warm to the touch yet possessed strength and durability known only to Waterford crystal. And it radiated a distinctive, silvery white brilliance, which Waterford Crystal's artists enhanced with deeply - cut ornamentation that gave the finished pieces a vivacious, traditional Waterford crystal sparkle. This great tradition lay dormant for a hundred years. But when Irish independence rekindled a passion for Irish arts in the 1940s and 1950s, a group of businessmen resolved to bring back to life the industry that had made the city of Waterford famous. They recruited a small band of hand - picked artists, and under the guidance of these masters, young apprentices learned the intricacies of the art of crysta l. In a few short years Waterford Crystal reclaimed its pride of place. Once more, it is the customary gift for royalty and heads of state. Patience, skill, and artistry had wrought a triumph at Waterford crystal. But the skill of Irish hands is only part of the story - there is also an uncanny power in those hands to impart something magical to glass. And in all of Ireland, no hands have been more patient, more meticulous, or more blessed with the elusive powers of art than the hands of Waterford Crystal's craftsmen. It was no idle boast. Patience, skill, and artistry had wrought a triumph at Waterford Crystal. A splendid array of drinkware, serving accessories, and decorative crystal flowed from the Glass House into the aristocratic home of Europe and America. King George III ordered a set of Waterford Crystal sent to his residence at a fashionable resort, where "it has been much admired" by court society. At two exhibitions, the Royal Dublin Society bestowed medals for superb design on Waterford Crystal's entries. Just as Waterford's art was reaching its full flower, the financial climate turned grim. They recruited a small band of hand - picked artists, and under the guidance of these masters, young apprentices learned the intricacies of the art of crystal. The Irish government has presented exquisite Waterford Crystal pieces to each American president from Dwight D.
Waterford Crystal trophies are awarded for distinguished achievement in science and to the champions of some of the world's most prestigious sporting events. Thus the glory of Waterford Crystal has reawakened - a splendid phoenix rising from the ashes. Once again, the name "Waterford" summons up all the elegance, the fine craftsmanship, and the magical allure of Irish art. 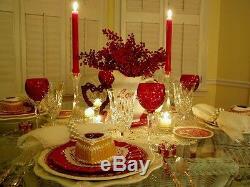 The item "Waterford Crystal Lismore Crimson Hock Wine Glass Set Of 2" is in sale since Sunday, June 1, 2014. This item is in the category "Pottery & Glass\Glass\Glassware\Waterford". 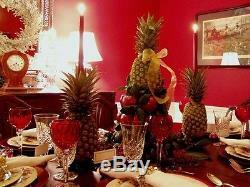 The seller is "femininetouch" and is located in Lakewood, New Jersey. This item can be shipped worldwide.